What an excellent book to read on the Mahabharat after so long! This book, again, came highly recommended from friends who have a deep interest in Mahabharat and have read many books on the topic. Although published way back in the 1940s, the book has managed to keep itself in constant conversation whenever books related to Mahabharat are discussed. And with good reason. 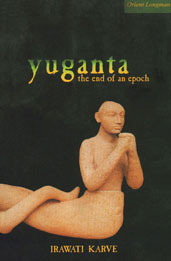 Yuganta is more a collection of essays written by Irawati Karve, each of which mostly discusses the primary characters in this Hindu epic from an anthropologic and social point of view. Her slightly feminist views on some subjects did however make me me wince at times. The book, taking its references from the critical edition of the Mahabharat which has tried to remove the later additions in the text, makes it a point to shock as it paints a different picture from the more popular ideas that we have about personalities. Sample this: “Bhishma”, who I had always thought as a brilliant fighter, having trained the Pandavas and Kauravas in the art of warfare before Dronacharya came along, was in Karve’s opinion “obviously… no great warrior”. She says this on the basis that Bhishma himself did not win any wars or even skirmishes where he greatly outnumbered the opponent, with the sole exception when he kidnapped the sisters Amba, Ambika and Ambalika. Ideas such as these are scattered throughout the book. And not necessarily do all of them make us raise our eyebrows in question. Some make us look at the world of Mahabharat from a different angle. Take for instance the part where she points out that Aryans were essentially conquerors and colonisers who ruled the local, tribal populations. This is brought into great focus when Arjuna and Krishna together burn down the Khandava forest to make space for their brilliant new city of Indraprastha. Legend has it that they killed each and every being that lived in the forest, animals and humans alike. In fact, this event lay the seeds of the enmity that the tribal Naga people had with the Aryans for over the next three generations at the least. The book is peppered with such interesting ideas and makes one look at the great epic from refreshingly new angles. The piece de resistance is the final chapter in which Irawati Karve summarises her own ideas about the The Bhagwad Gita and Mahabharat. She also points out that the original Mahabharat was way before the time of the Bhakti movement, which later turned Krishna into a godhead and other major characters into larger than life figures. What was even more disappointing was that a “sharp” and intellectual work which encouraged thought and debate on the nature of right and wrong was lost to being a religious text which asked the reader to follow the morally correct path without discourse. This book remains a fantastic read for whoever is interested in the Mahabharat. It has certainly whetted my appetite to read other versions of the epic, especially Jaya by Devdutt Pattnaik which has been on my to-read list for some time. Read more about the Yuganta on Goodreads. Buy it on Flipkart & Amazon.in. The book isn’t available on Kindle.